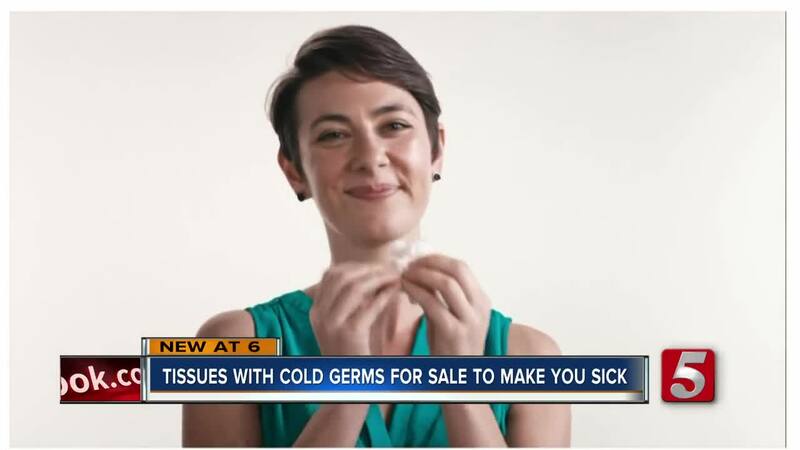 Would you pay $80 for germ-infested tissues to make you sick? If you think that's a crazy question ... you're right. But just in time for cold and flu season, a company is marketing used tissues, and if you believe their website, people are buying them. "This flu season keep your immune system feeling like your immune system -- Vaev" — that's part of the promotion from the company's website. So what exactly is the product? Specifically, tissues used by those with colds and then selling for nearly $80 a box to customers who want to get sick. "Yeah, that kind of flies in the face of what we tell the public," said Dr. Chad Kurzynske. The company's advertising blitz states you should be able to get sick on your own terms. WTVF reached out to the Los Angeles company with some questions, but have not yet heard back. But the founder told Time.com , "The simple idea is you choose now to get sick, with the idea in mind that you won't get sick with that same cold later." "I don't know how safe that would be," Kurzynske said. As you might imagine, physicians aren't thrilled with the idea of patients intentionally exposing themselves to germs-infused tissues to get sick. "You are going to be exposed to other cold bugs throughout the season so you are just ensuring you will get another cold during the season," said Kurzynske. He adds it's entirely possible if you care for yourself and wash your hands you won't get sick at all this winter. Why pay to catch a cold? The company's website says they are sold out. Of course, if for some reason you really do want to get sick, there are far cheaper ways to do it. Spend some time in a busy hospital lobby this time of year, or simply ask a sick friend to sneeze in your face. But most experts agree you should try to avoid cold germs. This product may sound like a hoax, but the company founder told Time, "People think it is fake. It's not."